The 2016, 2017, 2018, and 2019 birthday gift articles are up. There are so many retailers with fabulous birthday offers. Do not forget to check the birthday offers before your big day arrives. When I learn of a new offer or a change in offers, I update it. Even though I was not really shopping around my birthday, because life in general got in the way, there were a few Birthday gifts I had to pick up. The second one, from Ulta, was another completely free one. It can only be picked up in store. I give my birthdate upon retailer request. On 03/01/15, offers started coming in. They continued to roll in throughout March with most of them arriving on my actual birthday, March 15th. Remember to save some of your birthday shopping budget for your actual birthday, because so many offers will not come in until then. For the retailers who send the offers after your birthday, they seriously need to step up their game. As I mention on the birthday offer page, some offers are general. Others are unique. If you try to redeem before you get your own unique code, it will not work. Also, check the main retailer page before placing your orders, because the birthday offers are not always the best available offers. Ulta has completely free birthday gifts for all UltaMate members. Having an UltaMate account is free. After setting up your account, you do not have to make another purchase to maintain UltaMate status. That makes the gift completely free. In the past, I remember getting the offer before my birthday. This year, it did not arrive until my actual birthday. Although I cannot remember the expiration, I remember I had a few weeks to take care of this. We actually took a trip for my birthday, so I was out of town when the offer came in. My birthday landed at the start of the Days of Beauty (the twice a year event starting in March and September), so I chose 03/19/15 to visit. Check all offers on the special event page. This was the day Ulta sold Butter London polishes for $9 each. 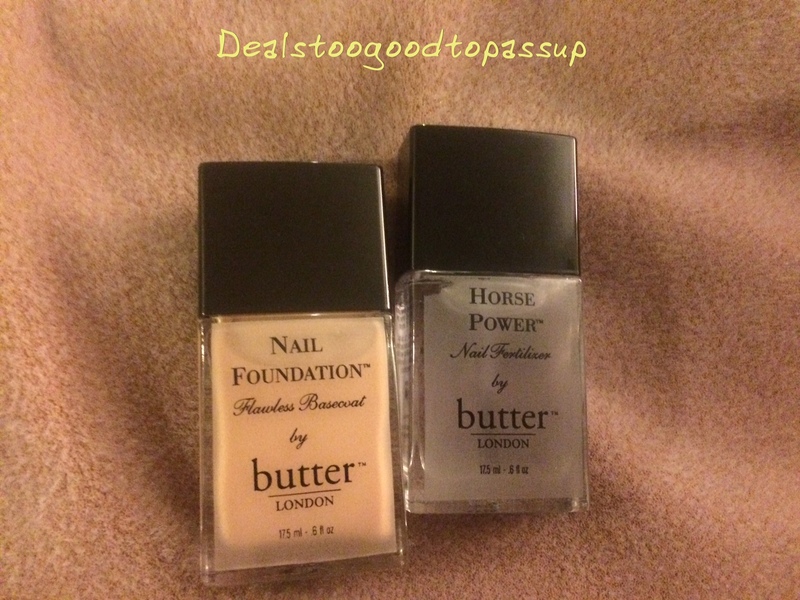 I chose Horse Power and Nail Foundation, because they usually retail for $19. That made them over 50% off. Platinum members also get a $10 coupon good toward anything for their birthday. I redeemed the coupon on this order making the total for both polishes $8 plus tax. Ulta gives members two times points during their birthday month, so I received 2.25 (1.25 base + 1.0 multipler) on the $8 purchase as well. It was a total of 18 points. Horse Power is clear(ish) and matte. Compare this to my other treatments, base coats, and top coats. 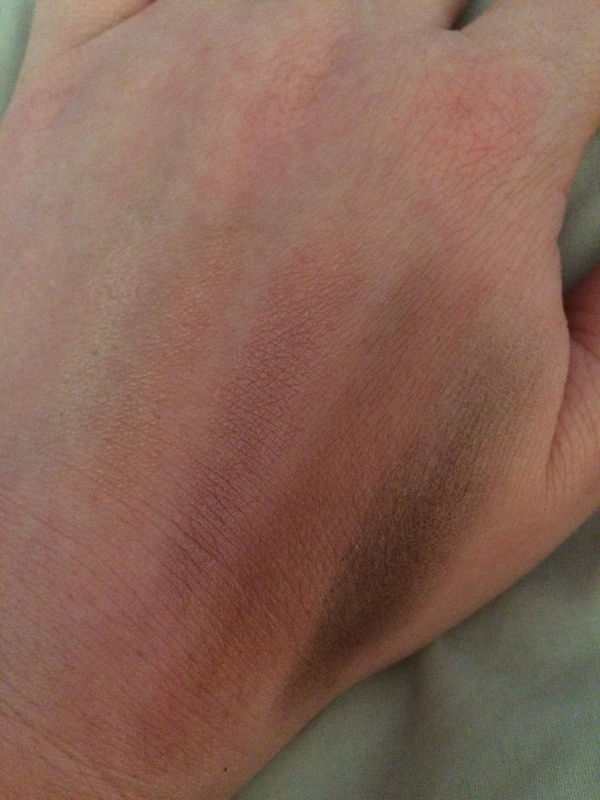 Nail Foundation is an almost beige-yellow. Compare this to my other treatments, base coats, and top coats. See this featured in a manicure. 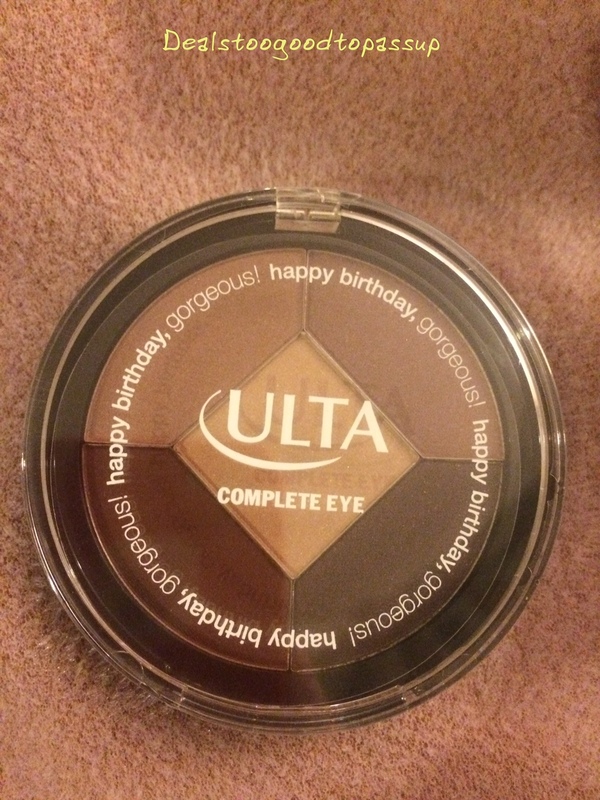 An Ulta Complete Eye Palette valued at $12 was offered for January through March birthdays. The offer changes every quarter, so this offer is no longer available. 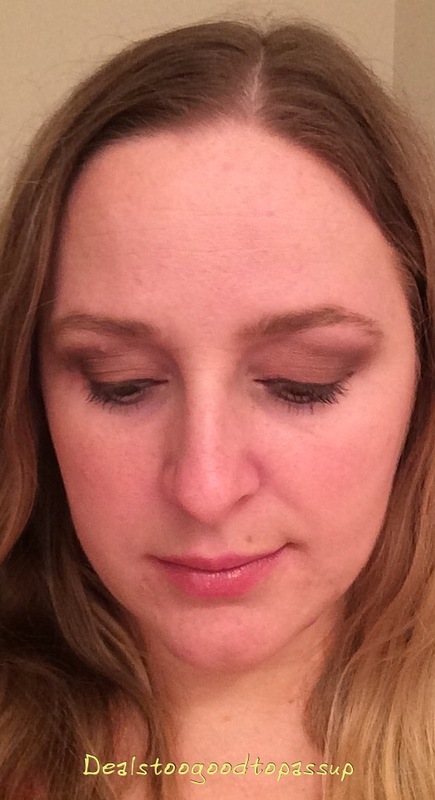 This was my first experience with Ulta shadows, and I was very impressed by the swatches. The 5 pan palette is actually quite large. Each shadow is 0.08oz making the total size 0.40oz. 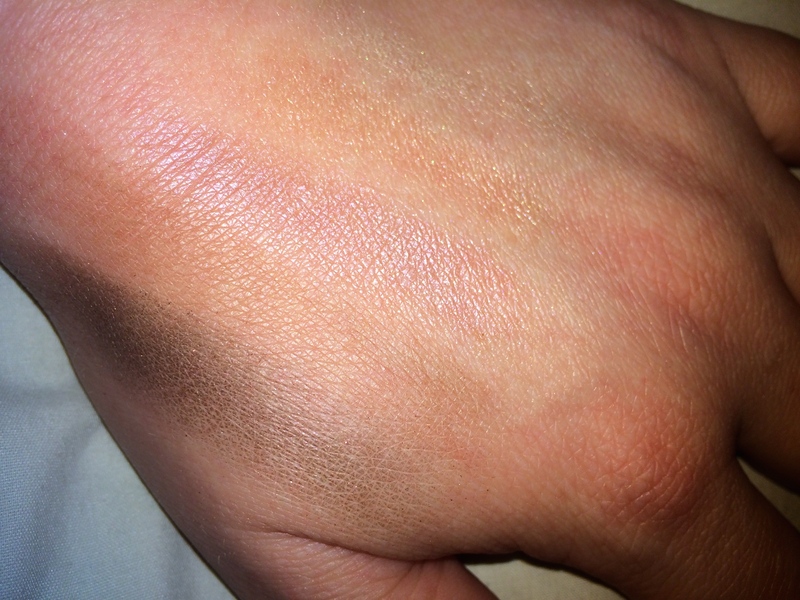 The lightest and darkest swatches did not impress me at all. You can barely see the lightest, and the patchiness of the darkest one stands out in the flash. They both look a little better without the flash. 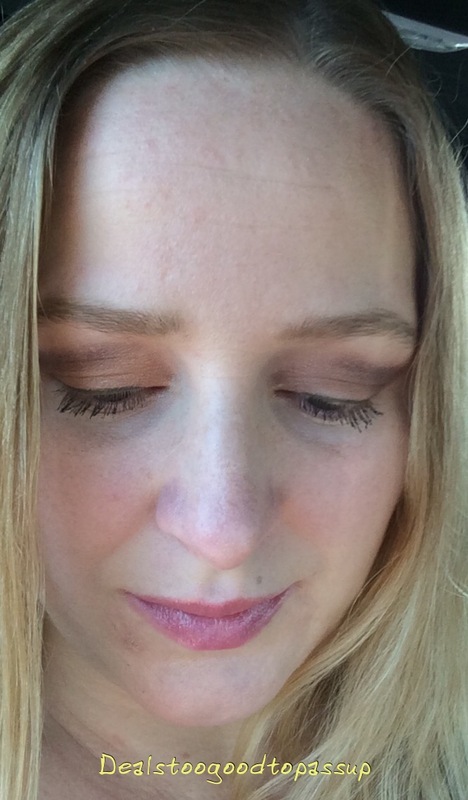 I liked the other three shades, which were smooth and pigmented. With the exception of the lightest and darkest color, each line was created with a single swipe. The shadows could have blended a little easier, but they looked good once I finished. It certainly did not look like a shadow that only cost $30 an ounce. When I first put this on, I was in a hurry, so I never got a fresh picture. I finally took pictures at the end of the night. The shadow was applied around 5pm and removed after 11pm. There was some light creasing and a little fading. If I had actually taken a before picture, you would have noticed I applied them a little darker. There was no weather to blame the creasing or fading after six hours on. As such, I decided I needed to give this another go to properly review. 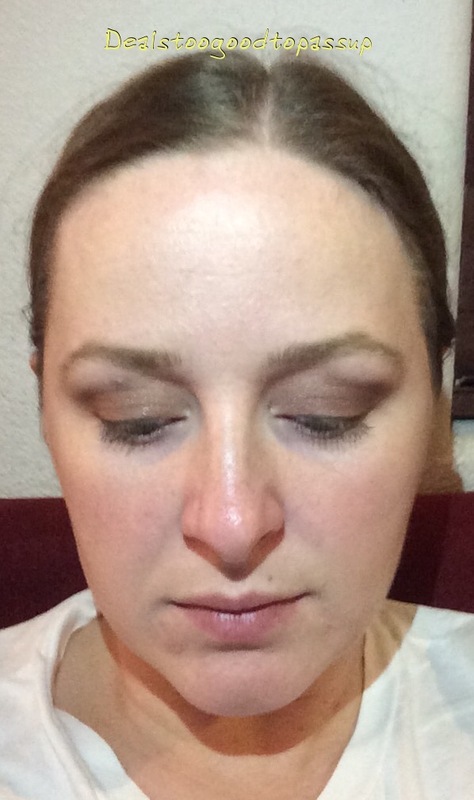 My second attempt found easier blending. I remembered to take before pictures to show how the colors start dark and fade throughout the day. This was applied at 11am. I had very slight creasing the second time, even less than the first time. Considering I was outside more and the pictures were taken after over eight hours of wear compared to six with the previous, I felt this was a better experience. You can notice the slight fading. These are the only pictures with the flash, which make the shadows seem a little more glittery than they actually are. The glitter is very micro and not noticeable in regular light. I was disappointed when I saw my gift would be Ulta branded, but the shadow was nicer than I expected. I’d call this shadow pretty average. There are better shadows, but there are also worse ones. Thanks to the Days of Beauty and my birthday offer, I think this $8 purchase was worth a trip to the store. If your birthday is coming before September ends, the current offer is a Perversion mascara mini from Urban Decay. I removed the email addresses from your comment, because comments post publicly to the blog. Birthday coupons are good for 30 days from your birthday, so you are still within your redemption period. Call Ulta and tell them you did not receive a coupon. They should be able to get you a replacement coupon. The associates in the store will usually not give you a present without a coupon.